Maggie Serota: The Philadelphia Eagles are America's football team now. And Trump's feud with them proves it. Maggie Serota The Philadelphia Eagles are America's football team now. And Trump's feud with them proves it. Trump could learn a lot about patriotism and service from athletes who have proven themselves to be articulate, thoughtful role models. Since the late 1970s, the Dallas Cowboys have been known as “America’s Team.” In light of recent Trump White House statements, however, Dallas might want to consider handing that title over to the Philadelphia Eagles. "The Philadelphia Eagles are unable to come to the White House with their full team to be celebrated tomorrow,” the White House said in an eleventh-hour statement issued on Monday after learning that only two or three players, owner Jeff Lurie, and mascot Swoop were able (or willing) to meet President Donald Trump, as has become customary for championship teams in the U.S. “They disagree with their President because he insists that they proudly stand for the National Anthem, hand on heart, in honor of the great men and women of our military and the people of our country. The Eagles wanted to send a smaller delegation, but the 1,000 fans planning to attend the event deserve better." There’s only one problem with this statement: It’s patently false. No one on the Super Bowl championship team took a knee during the national anthem this season. (Although even if they had, so what?) Instead, Trump’s statement was a clear attempt to distract attention away from the fact that Eagles players had snubbed him. The presidential ego strikes again. Trump is slandering athletes who are exactly the kinds of role models Americans need today. Whether or not you agree with their decision, Eagles players aren't required to attend the White House ceremony. Torrey Smith, one player who had planned to skip the ceremony, laid out a clear and concise argument for his decision to skip it during an interview with CNN’s Don Lemon in February. What’s really frustrating, however, is that Trump is slandering athletes who are exactly the kinds of role models Americans need today. Over the past few years, professional athletes — and the NFL in particular — has been rocked by a series of sexual assault and domestic abuse allegations. Commanding huge salaries and wielding tremendous cultural influence, professional athletes seem to be making headlines for all the wrong reasons these days. Many of the current Eagles players, on the other hand, have consistently shown a commitment to progressive causes and to their community. Trump — who secured five draft deferments and once described the threat of contracting a sexually transmitted disease as his own “personal Vietnam” — could perhaps learn a thing or two about patriotism and service from the team he now maligns. Compare, for example, the president’s reaction to the deadly white nationalist protest in Charlottesville to that of Eagles tight end Chris Long, a Charlottesville native. Trump equivocated in the wake of the disaster, initially implying that there were “very fine” people on “both sides.” Long, on the other hand, swiftly condemned the attack, noting that there is “no place” in America for white supremacy. “This isn't a political issue. This is right or wrong. I believe you're on one side or the other,” Long told NBC Sports Philadelphia in August of 2017. “For me, being from Charlottesville, no one wants to see you sit idly by and watch that stuff happen and not say anything. And I wish there was more categorical denial from some very important people in this country who have had the opportunity to strike it down but didn't." The most Trump did to invest in Charlottesville was to plug a Trump-branded winery in Virginia during his notorious “both sides” press conference following the riots. 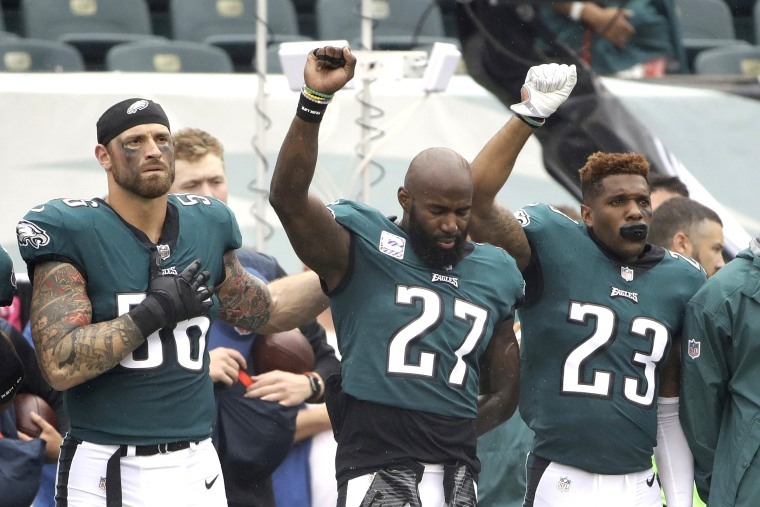 Given that Trump just took a meeting with Kim Kardashian regarding criminal justice reform (resulting in the commutation of Alice Johnson’s prison sentence), and his adviser and son-in-law Jared Kushner claims the issue is a priority, it’s too bad he hasn’t extended an olive branch to star safety Malcolm Jenkins. Jenkins is the co-founder of the Players Coalition, an organization that lobbied the NFL to donate $89 million towards programs funding community activism and racial equality initiatives through 2023. Jenkins, along with Long and Smith, also met with Pennsylvania state legislators in 2017 to lobby for a law that would do away with mandatory minimum sentencing for nonviolent drug offenders. He’s made trips to Washington D.C. to try and persuade members of Congress to abolish private prisons and crack down on police brutality. "Football is easier than doing this," Jenkins told the Associated Press after meeting with lawmakers Capitol Hill in 2017. "You've got to do the research, and you've got to come prepared. And when you're speaking on behalf of other people, you want to make sure you bring the right voice to the table." Although, Smith, Long and Jenkins are the most visible members of the 2017 Eagles in terms of activism, other players, like safety Rodney McLeod Jr. and defensive end Brandon Graham, have also been active in the Players Coalition and other social justice organizations. And tellingly, even more conservative players reportedly blanched at the prospect of a Trump photo op. The city of Philadelphia isn’t going to stand for his grandstanding anymore than the Philadelphia Eagles are going to let themselves be unfairly attacked. If Trump had any self-awareness, he would be ashamed that the athletes he slandered seem to contribute more to the community in their spare time than the president does as a full-time public servant. But of course, this is Trump we’re talking about so of course that will never happen. Ultimately, Trump tangled with the wrong group of players — and the wrong group of fans. The city of Philadelphia isn’t going to stand for his grandstanding anymore than the Philadelphia Eagles are going to let themselves be unfairly attacked for standing up for what they feel is right. And what’s more American than that? Maggie Serota is a staff writer for Spin and a Phillies fan living in a Mets world. Her work has also appeared in Glamour, Pitchfork, and Village Voice. She once interviewed Lenny Dykstra for Esquire and lived to tell about it. Read more: Are Eagles fans really the worst fans in the NFL? Not by a long shot.